There are two distinct methods of applying a combination of resin and aggregate onto a driveway or patio surface – Resin Bonded and Resin Bound – both of which involve gluing coloured aggregates to an existing surface. Resin bonded and resin bound systems create natural stone overlays which, as the term suggests, include covering existing concrete or tarmacadam surfaces with aggregates which are available in an extremely wide range of colours. Resin and aggregate driveways are fairly resistant to weeds as well as oil spillages, they do not fade in Ultra Violet light and are relatively low maintenance. The natural stone aggregates are held in place with epoxy or polymer resins but the similarity of the names of the two systems has caused confusion with customers. To add to the confusion a variety of other names are commonly used by the various manufacturers and installers to describe resin and aggregate surfacing systems, including resin bonded gravel, resin bound paving, resin bound gravel, resin bound stone and resin bonded stone. Resin bonded surfaces are formed by applying a coat of resin to the existing surface and scattering or broadcasting loose aggregate over the tacky surface. 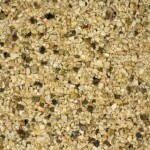 The loose aggregate bonds to the sticky resin surface, hence the name resin bonded. When the resin has cured or dried, which can take as little as an hour or two, any excess aggregate is removed and the surface is sealed with a UV protective coating. 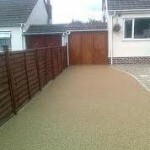 Resin bonded driveways and patios have the attractive appearance of loose gravel surfaces without the associated problems of gravel migrating and being lost over time. The resin and aggregate finished surface provides excellent skid resistance and traction even when wet, and is ideal for sloping surfaces which could be slippery if surfaced with other types of paving. Although the thickness of the resin bonded aggregate layer is only 3 to 6 mm (depending on the type of resin and aggregate used), its durable finish and non-slip surface make it suitable for both domestic and commercial applications. Resin bound surfaces are formed by preparing a ready-mixed combination of coloured natural stone aggregate and resin which is applied to the existing surface with a trowel and float. This method has acquired the term resin bound because the aggregate is already bound in the resin prior to being applied to the existing surface. 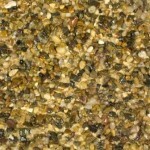 With a wide choice of coloured aggregates, resin bound systems are very decorative but also functional. The open structure offers a permeable surface which satisfies SUDS (Sustainable Urban Drainage Systems) regulations with respect to the control of surface water, when overlaid on a porous sub-base. 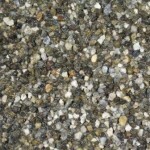 The resin and aggregate mixture is trowelled onto an existing surface in a layer approximately 10 to 18 mm thick and is ideal for domestic driveways, patios, footpaths, cycle ways and other pedestrian areas. Both resin bonded and resin bound aggregate surfaces require a sound existing sub-base on which they are applied, such as concrete or tarmacadam, with no major cracks or pot holes. The sub-base should be cleaned of all loose debris and organic material with a fungicidal solution and a power wash before being rinsed with clean water. The existing sub-base surface must then be thoroughly dried prior to application of the resin bonded or resin bound aggregate material. Neither resin bonded nor resin bound aggregate surfaces should not be applied to concrete block paving or concrete slabs as the surface layer of resin and aggregate will crack along the lines of the joints between the individual blocks or paving flags. This is referred to as reflective cracking and although the resin based aggregate surfaces are tough, when a load is applied to the blocks below, any slight movement will result in cracking of the upper surface layer. In fact, where a resin bound aggregate surface is applied to a concrete sub-base which has contraction or movement joints cut into it, the joint should be continued through the surface layer along the line in the concrete. Any subsequent movement in the concrete sub-base will be dealt with by the new joint in the resin bound aggregate layer rather than it causing random cracking. The extremely wide choice of coloured natural aggregates means that resin and aggregate surfaces provide an ideal decorative paving alternative to concrete block paving, tarmacadam and pattern imprinted concrete. 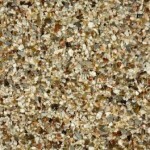 Blending natural and specially coloured gravels can provide hundreds of colour combinations. Resin and aggregate products can be suitable for all manner of domestic paved areas such as driveways, patio areas and footpaths as well as for commercial applications. The aggregate surfaces provide a functional and durable, relatively maintenance free skid resistant surface and can even be designed to suit corporate branded colours and logos. As with many types of paving however, the disadvantages associated with resin and aggregate surfaces are largely attributable to poor workmanship and / or a poor sub-base. Unsuitable sub-bases which are not repaired or resurfaced, or not properly primed, can result in the resin not bonding, and ultimately delaminating. Unscrupulous contractors can also skimp on the amount of resin and aggregate used leaving a patchy surface, or even dilute the resin so that a proper bond is not achieved. 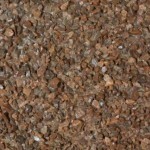 Prices for resin and aggregate driveways and patio areas vary tremendously, though the average cost seems to be between £40 and £60 per square metre, with minimum charges for small areas. One of the major disadvantages however, can be the cost of preparing a suitable sub-base if the existing surface is unsatisfactory. Resin and aggregate driveways are fairly economical as long as there is an existing, suitable sub-base but for new areas where virgin land is the starting point, the cost of a concrete or tarmacadam driveway in addition to the cost of a resin and aggregate surface over it, can be prohibitive.